Delicious Red Velvet Poke Cake with homemade Cream Cheese Frosting. 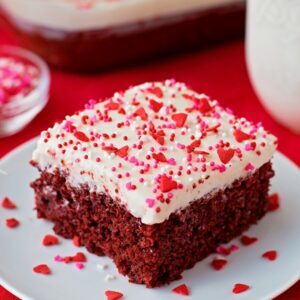 It's super moist and velvety and perfect for Valentine's or any special occasion. Preheat oven to 350 degrees F. Lightly butter/flour (or spray) a 9x13-inch baking pan, set aside. Using a hand or stand mixer, beat the butter and sugar until light and fluffy, 2-3 minutes. Add the red food coloring and vanilla extract, beat until combined. Add the eggs one at a time, mixing just until incorporated. In a small mixing bowl, whisk together the flour, cocoa powder, salt, and baking soda. Alternate adding the dry ingredients and buttermilk/vinegar by hand. Mix together with a wooden spoon just until combined, do not overmix. Pour the batter into the prepared baking pan, spread into an even layer. Place in the oven and bake for 25-30 minutes or until a cake tester inserted into the center comes out clean. Remove and poke holes into the cake with a fork. Pour the condensed milk over top (I only used half but you can use the whole can). Allow the cake to cool before frosting. To make the frosting, beat the butter and cream cheese on high speed for 2-3 minutes, then reduce speed and add the powdered sugar. Add in the salt, vanilla extract and milk. Beat for an additional 2-3 minutes until the frosting is light and fluffy. Spread across the cooled cake and decorate as desired. If you are using gel instead of liquid food coloring, add an additional ⅓ c. of buttermilk to the recipe.